As we wind down from the height of summer, travelers and locals alike are headed home with stories of seasonal adventures. Many of us snag souvenirs, from curiously shaped rocks to refrigerator magnets, to carry our fond memories forward. While you can always find a great collection of treasures at the Museum gift shop (an assortment of rubber sharks, anyone? Fossil sea cow hat? ), this month we’ll take a closer look at a souvenir found within the Collections: a small glass bottle of crude oil. 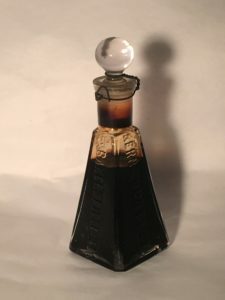 This bottle is part of the Laura Hecox Collection, and it is about four inches tall with a wired shut glass stopper. Its contents are the deep brown and black that indicates heavy crude oil. The embossed lettering along the sides of the bottle reads “1904 Bakersfield” and “Kern County Oil”. 1904 was the year that Laura gifted a large portion of her collection to the City of Santa Cruz, so we consider this bottle to be one of those pieces that she was not losing, “taking everyone else into partnership with her enjoyment of it,” as she was quoted by a newspaper of that day. That same year was also significant in the history of Kern County Oil. The first oil wells were drilled in Kern County in 1877, and subsequent years saw the establishment of many productive oil fields and the incorporation of various companies to capitalize on this resource. It was later, in 1904, that the Kern River oilfield produced 17.2 million barrels of oil, making it the largest oil field in California at that time. While the Kern River oilfield is still producing, our souvenir bottle memorializes this boom in California’s oil industry. Such souvenirs were not unique — a dip into museum catalogs and collecting blogs shows these sorts of trinkets were widely traded, from Pennsylvania in the 1930s to Norway in the 1980s. The Drake Well Museum and Park in Titusville, Pennsylvania, where the first American oil well was drilled, sells crude oil souvenir bottles to this day. In some cases these souvenirs move beyond the function of history marking or memory making. The oil in these bottles can have scientific value. Researchers can analyze them to gain a more robust geochemical and historical understanding of their associated wells, for example. Crude oil souvenir bottles can even have philanthropic value. In the wake of the 2010 Deepwater Horizon oil spill in the Gulf of Mexico, Louisiana-based activists organized to sell a limited edition series of bottled spill oil at $1,000 a piece, with proceeds going to support workers whose fishing jobs were devastated. While a major value of our Kern County oil sample is its ability to speak to the past, it also provides an interesting comparison to the present. Here at the other end of California’s oil history, in which we recognize the climatic consequences of the fossil fuel industry, how do we relate to oil? As we strive to leverage the Collections to connect people to nature and science, it is important to showcase artifacts and specimens that document the changing relationships between people and the natural world.